Red Lobster’s menu is full of bad things. But there is the Lighthouse Menu, which is a bit better. Still nothing appealed so I made my own lunch entree. 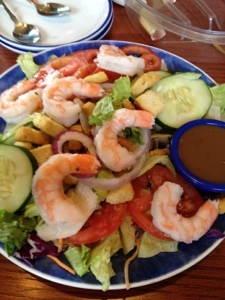 Double green salad and a double shrimp cocktail. For Weight Watchers points, I calculated 10 ounces of boiled shrimp and 3 tablespoons of a vinaigrette dressing, or 10 points overall. In today’s New York Times, restaurant critic Pete Wells joins the long line of NYT reviewers awarding four stars to Le Bernardin. The review talks about how the restaurant has managed to stay on top after 18 years under the guidance of Chef Eric Ripert. It is a combination of change — in menu and atmosphere — but staying true to fundamentals. And the essence at Le Bernardin is fish, fresh and wonderfully cooked. It’s been at least four years since my last visit, but I remember it well. I was relatively new on Weight Watchers and uncertain if a meal at a famous restaurant would sabotage my efforts. It did not. Each dish might be sauced, but the flavors were so rich that a tiny bit augmented the fish perfectly. My next weigh-in went great. Wells review notes how quickly the menu changes, with one excellent dish replacing another. And last summer, the restaurant itself got a facelift. It may be time for another visit. Nothing about The Oceanaire Seafood Room in Atlanta will knock your socks off. It’s not inventive, it’s not especially creative and god knows, it’s certainly not modern. When you’re sitting in a dining room tricked up to make you feel like you’re eating on the Queen Mary, and dessert includes baked Alaska, only a patron as mad as old King George III would expect nouvelle cuisine, farm-to-table or molecular gastronomy. No, this is a safe and predictable “expense account” kind of fish joint, with prices to match, and what’s on the menu here is seafood, fresh and executed well. After weighing in 3 pounds lighter than a week ago at Weight Watchers, The Restaurant Dieter and some pals had good more reason to choose safe and stay the course. For the non-dieter, the Oceanaire menu offers all manner of preparations that can send you home having doffed a 3,000-calorie-plus meal. You can get fish fried, with drawn butter and Louied. You can get something turf-y with rich crab Oscar on top. You can get vegetables sauteed or covered in Hollandaise sauce. And then there’s the aforementioned baked Alaska. But there are also enough signals that the dieter will not only be accommodated, but celebrated. 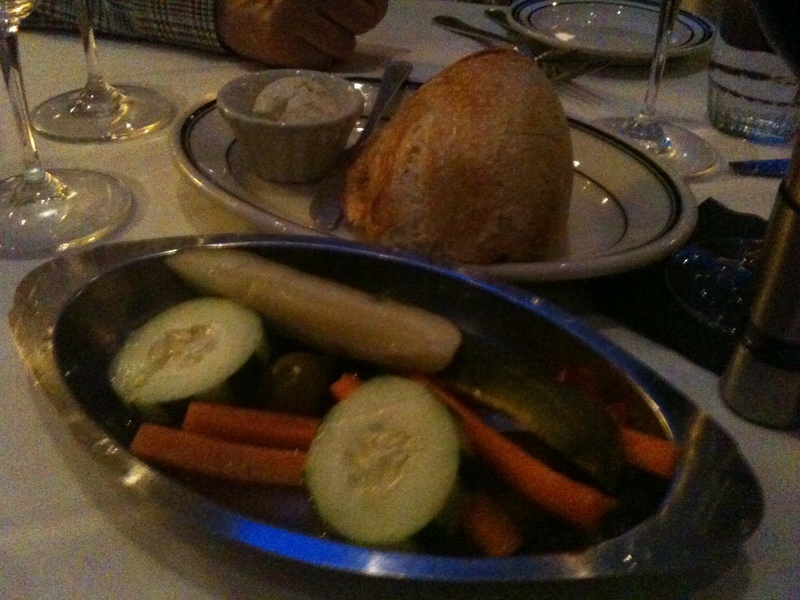 That sense starts with the dish of crudites that arrive at the table at the moment a basket of the crusty bread does. Carrot sticks, cherry peppers, olives, cucumber slices sit atop a cold bed of ice. How often do you see that? It’s like a big welcome sign. Thanks to that gesture of thoughtfulness, The Restaurant Dieter managed to pass up the bread. And when his companions appetizers “for the table” arrived, he similarly bypassed the fried calamari in favor of his own seafood chopped salad. 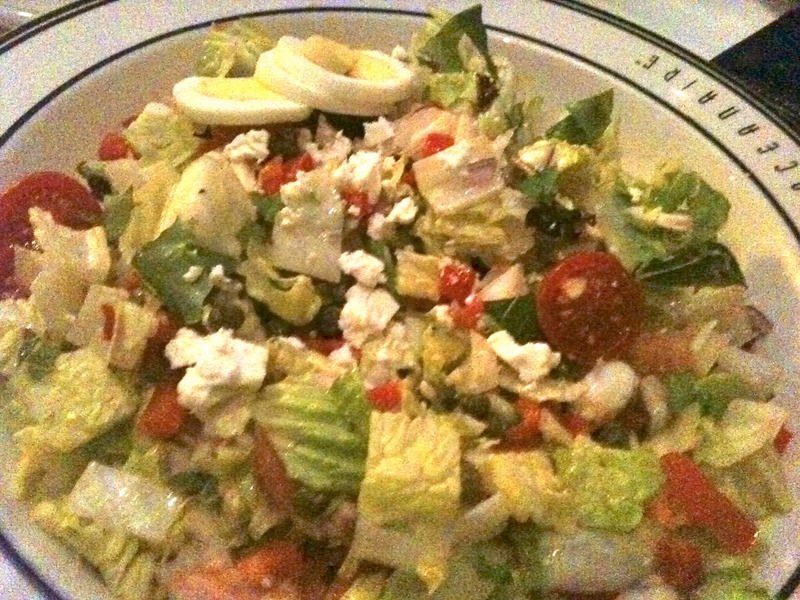 It consisted of lettuce, tomatoes, red onion, kalamata olives, capers, hard-cooked egg, cold boiled shrimp and crab and feta cheese. The kitchen was happy to put the feta and vinaigrette on the side. Rather than use the only spoon at the table — a large one that came with the calamari — I waited for a server to bring another and ladled on two ice tea spoonfuls of dressing and about an ounce of feta. With all the other chopped ingredients oozing their own juices, it was plenty — even on such a large salad. 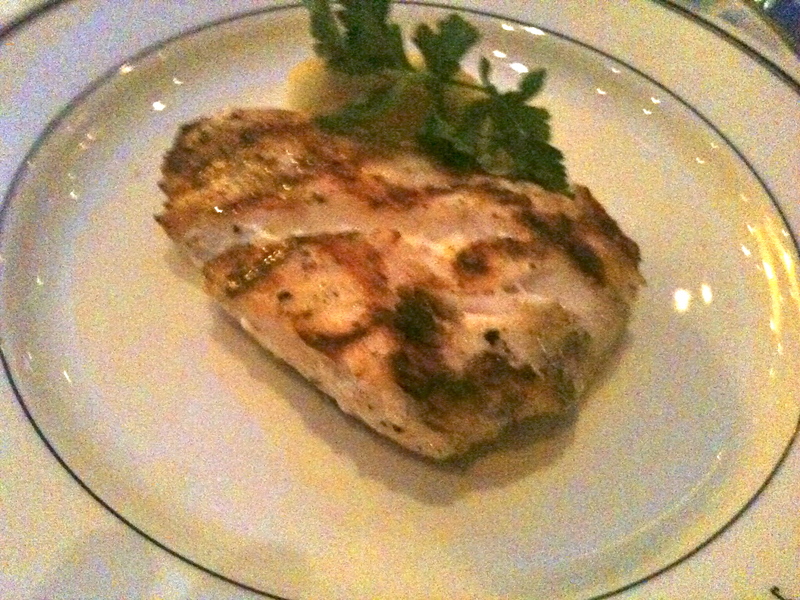 The entree was a grilled grouper that arrived without having been bathed in the lemon butter at my request. It also was a large meaty portion. 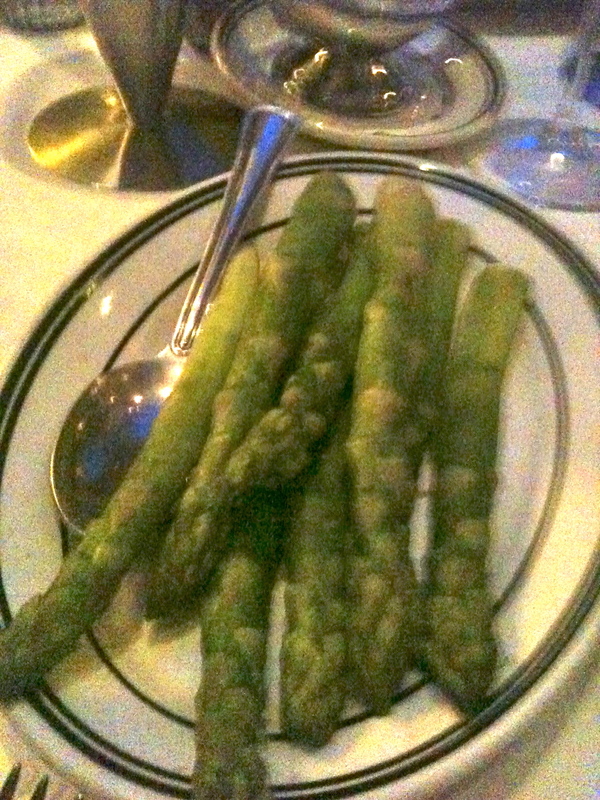 For a side, I had the steamed asparagus with the Hollandaise, which already comes on the side and was politely ignored. The spears were big and fat. I ate them with my fingers, just like my companions ate their Parmesan and truffle oil French fries. 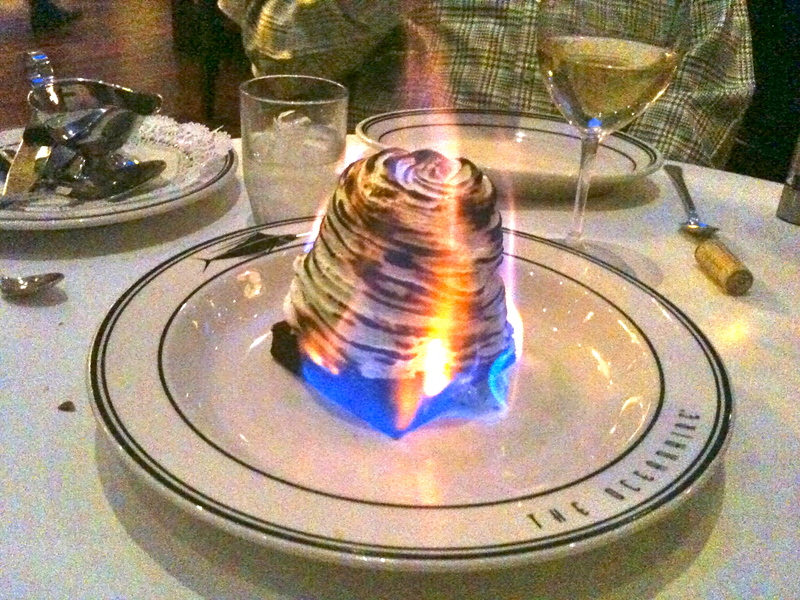 And for dessert, my companions ordered the baked Alaska for two, which really served four. Once the fire died down, a spoonful was enough to send me home safe, sound and satisfied. When you’re trying to watch your weight, sometimes that’s enough. Review: Goin’ Coastal, Atlanta, Ga. Going to a fish restaurant is often a good bet for a dieter. Goin’ Coastal, a new restaurant in Atlanta’s Virginia-Highland neighborhood, is an even better bet. Restaurants that set out to accommodate dieters have the opportunity to exceed expectations. This unpretentious little “sustainable seafood joint” (as it calls itself) did exactly that. Eating fish at this restaurant need not be penance for your non-dieting friends. They can order the fish-and-chips with hush puppies, coleslaw and buttered corn on the cob. But for you, there are abundant choices. From the fresh catch board, one of the choices is an excellent baked preparation with vegetables, a lot of fresh basil and a lightly oiled marinara sauce. 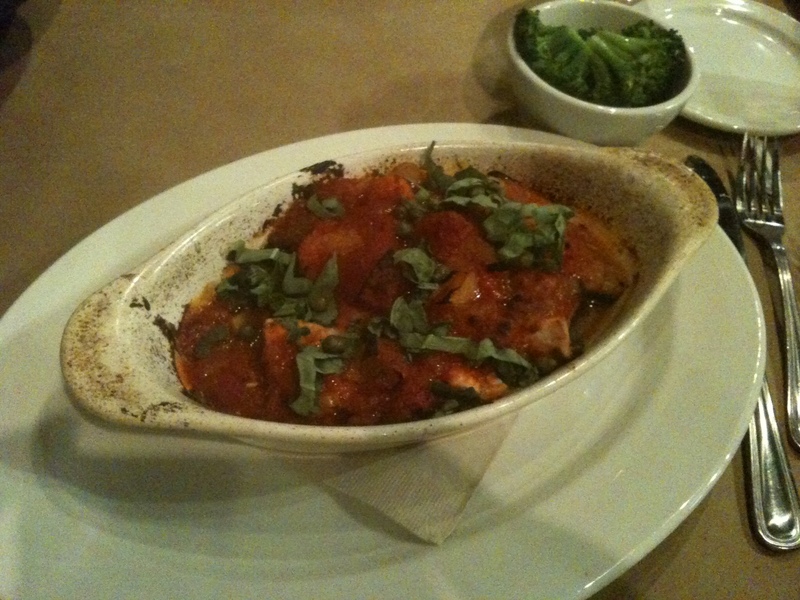 On the meaty swordfish, it was flavorful and healthy. It came with a choice of sides, which on that day included steamed broccoli. But the kitchen really outdid itself when The Restaurant Dieter ordered poorly. As a starter, the half-pound of peel-and-eat shrimp seemed perfect: cold, meaty with a horseradish-infused cocktail sauce. 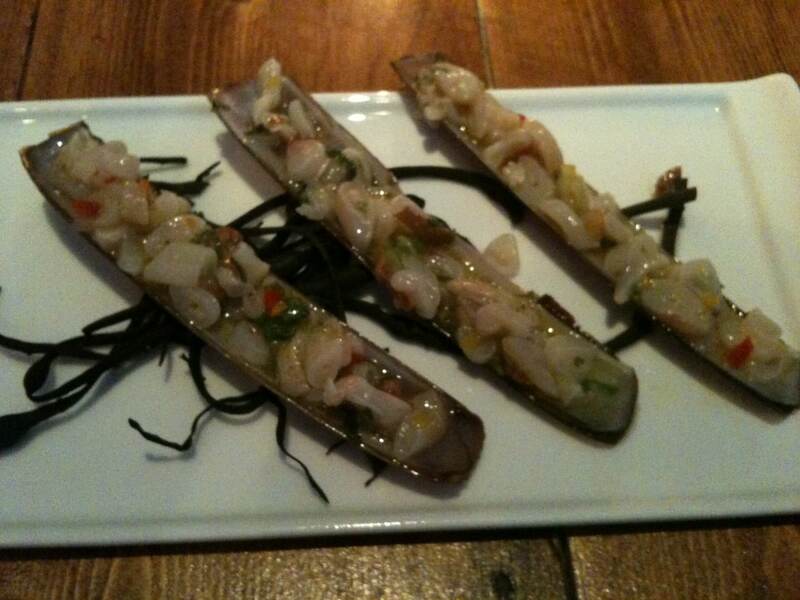 But what arrived were shrimp doused in a oil-based marinade before being grilled. It was a high-fat dish, and I’d neglected to ask how it was prepared. 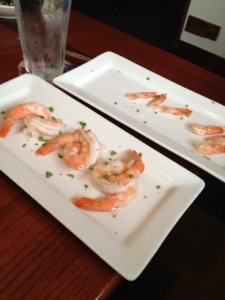 Ten minutes later, the shrimp arrived, boiled and sitting atop a bed of ice. That’s the kind of service that keeps dieters coming back. The Restaurant Dieter’s spouse was trying so hard to do the right thing. As I’ve previously mentioned, eating out is his passion. When we’re in New York, it’s nearly an obsession. I had a nice lean turkey sandwich on a bagel with an apple for lunch. He walked a couple of blocks to his new favorite, Luke’s Lobster. But TRD Spouse was trying hard yesterday when he went online to make reservations for pre-theater dinner with a friend. With his overworked Open Table account humming, he booked Pier 9 in Hell’s Kitchen because of its emphasis on fish. Isn’t love grand. The menu was promising. It offered dishes for the decadent diner (Lobster Mac ‘n’ Cheese) to, in the entrees, a section entitled “simply prepared.” With baby bok choy as a side, it featured six fish choices and three sauce choices: green curry/shiitake, lemon/Tuscan olive oil/capers and verjus emulsion. The latter turned out to be a butter sauce, so I opted for the curry/shiitake. For a starter, you can never go wrong with ceviche. I always imagine a half-cup of so of fresh fish, drenched in a bright acid with a nice clean flavor. That was spot-on on most counts, but the portion was sorely disappointing. Three shells contained, at most, three tablespoons of ceviche. It’s New York, but at $13 one somehow expects a little more. Whoever was prepping scallops in the kitchen that day had a really heavy hand with the salt. Mine were so salty they should have been sent back as inedible. My friend ordered the seared day boat scallops, which came in a celery root puree with eggplant, capers, raisins and pine nuts. Ditto on the salt. The TRD Spouse, having little to no diet concerns, had what looked like a half a paint can (literally) stuffed with lobster, corn, potatoes. He loved it. For dessert, TRD Spouse and guest both had the salted caramel rice crispy treat with chocolate mousse and mascarpone ice cream. I tasted the latter and could easily have eaten a sizeable bowl of that. Instead, I opted for the fresh fruit plate. It is my patriotic duty to order fresh fruit, given how few restaurants are thoughtful enough to include it on the dessert menu. What arrived at the table was a beautiful mosaic of slightly ripe watermelon but perfectly ripe strawberries, blueberries, raspberries and pineapple. Despite drinking multiple glasses of water and ice tea, I left the restaurant with that salty taste for something — anything — and therefore settled into my seat at the theater with a box of milk duds. And then just before turning in for the night, I had some cookies from the deli across the street. So bottom line on Pier 9 is: go but ask the chef to go easy on the salt.